Uduino version 3.0 is a milestone. This version has several new exciting features. 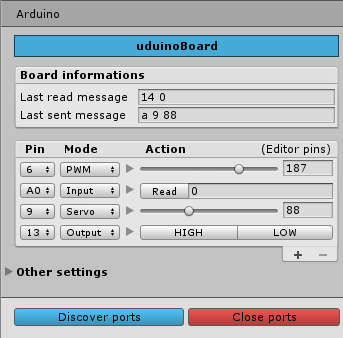 Uduino plugins are small components that can extend Uduino to other platforms and method of communication. By default Uduino talks to the board connected on a desktop via serial. However, there are other ways to communicate with an Arduino board, which might be more convenient, like wireless for instance. As Uduino's Plugins requires a substantial amount of work and are not needed for every user, I made the decision to sell them as individual packages on the asset store. The price is the minimum allowed by the Asset Store, $4.99. So far, Uduino WiFi and Uduino BLE are available (soon!). 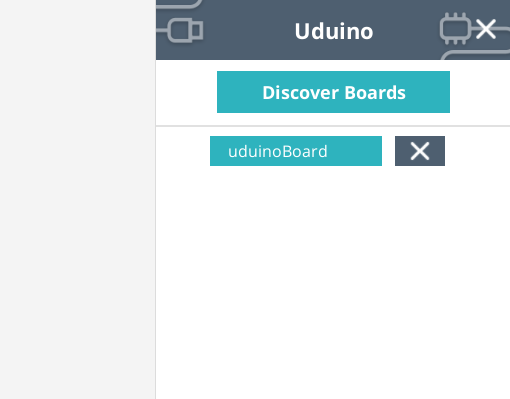 You can now display real-time Uduino interfaces. 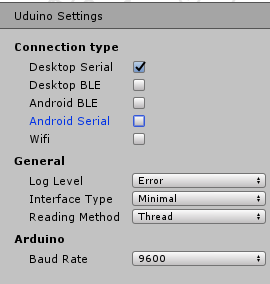 This optional setting can be found under Uduino Settings > Interface type. These interfaces are used only to display and detect the Arduino boards. It but it can be useful in your built. There are two types of interfaces. Minimal Will display only a small band at the bottom of your game. Full will display the full interface as a side panel on your game. 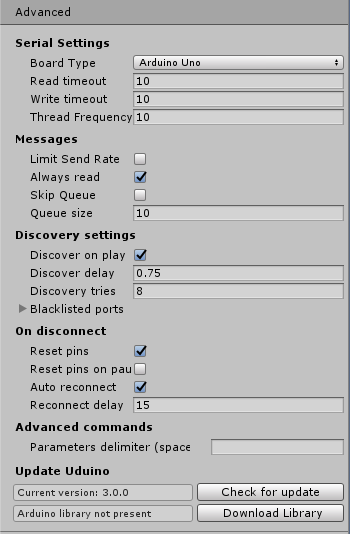 The default Uduino panel to set pin modes has been updated to match Unity's style. Same functionalities, new style! New advanced settings are available for users who want more control over the hardware optimization. Finally, Uduino has been refactored from scratch and is faster and more stable. Improvements include Thread optimization, reading speed, API clean and new example.